CLS has been a long-time participant in the General Mills Box Tops For Education program. This fundraiser generates a lot of cash for the school. In 2014-15 we earned $1,992. We have earned $18,204 since the inception of our participation in the program. 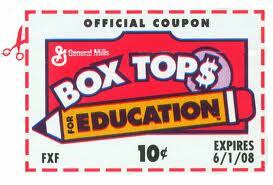 Box Tops coupons can be found on the packaging of hundreds of food products and other household items. Some of the brands include Pillsbury, Hefty, Avery, Welch’s, General Mills cereals, Betty Crocker, Juicy Juice, etc. Check your pantry to see which products carry the Box Tops coupons and then clip the coupons from the packaging. Please trim the coupons to include the expiration dates. Then count into groups of 50 and put them in a baggie with the number of coupons marked on the front. Please keep Bonus Box Tops separate from the others. These come in different forms, such as a tape register print out that says “Bonus Box Tops” or it might be an oversized coupon with the word “Bonus” printed on it. These do not need to be sorted into groups of 50. Central earns $0.10 for each coupon we submit. It adds up quickly. Please visit www.boxtops4education.com for information on how to enter online contests to win more Box Tops for the school and to find a complete listing of products. If you’re interested in helping trim and count the Box Tops, call the school office at 319-223-5271. Click on the words “Box Tops Products” below to see a full listing of the products that carry Box Tops.